Black is always right, but white is sometimes wrong. The "what to wear" is an issue men face when deciding on an appropriate dinner jacket for more formal occasions. The two traditional choices are black or white. However, beware of wearing white at the wrong time of year. Invitations that specify "black tie" mean you must wear a proper black-tie tuxedo. A black suit, or ordinary black jacket isn't an acceptable substitute. There are many outfitters who hire out evening jackets, so there is no need to buy one. You must wear it with classic black-tie trousers, a black bow tie and a white wing or turndown collar shirt. 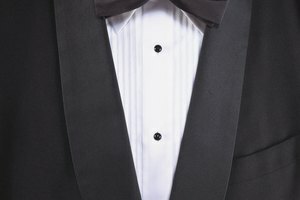 If the invitation says that black tie is "preferred," "requested" or "optional" then you are not obliged to wear a tuxedo, but it is better etiquette if you do. If you opt not to, then wear a dark suit. The white dinner jacket is an attention-grabber. However, limit its use to warm-weather occasions, which was what it was originally designed for in the 1930s. According to Black Tie Guide, gentlemen should never wear a white jacket to an occasion in the city: Country club and yacht club parties are more appropriate settings for this alternative to black. Wear a white tuxedo with classic black-tie trousers, white shirt and black bow tie, as you would with a black jacket. McKenzie, Eleanor. "Dinner Jacket Etiquette." 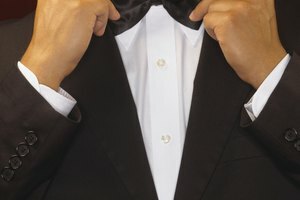 Synonym, https://classroom.synonym.com/dinner-jacket-etiquette-10328.html. Accessed 20 April 2019.